Mold is considered a bio-contaminant that is potentially toxic to humans, depending on the individual. Where there is mold, there is a water source causing its development and sustaining its growth. Unwanted water in your Eastampton, NJ home or business will lead to serious water damage and compromised structural integrity, if the water source is not properly addressed. Bottomline, the toxic nature of mold and the damage mold and water can do to your home creates an unsafe environment for your and your family. Mold development must be addressed promptly and safely. If you suspect a potential mold contamination in New Jersey, you need to consider contacting a certified mold professional to conduct a mold inspection in Eastampton, NJ. A trained and certified mold professional will be equipped with the necessary tools, knowledge, and skills to correctly assess and address your mold problems. Each case of mold contamination is unique, so it is important that the scope of work for mold remediation in Eastampton, NJ is specifically developed to address your individual mold needs. While each mold remediation will be different, at the core of every mold remediation are 3 key components: determining causation, containing the contamination, and proper cleanup & disposal. Determining Causation– The success of a mold cleanup hinders on the identification of the water source. At the end of a long moldy trail, there is a significant moisture promoting the mold activity and our technicians are trained to get to the bottom of it. Finding, stopping, and fixing the source of the water intrusion should be top priority. Containing the Contamination– Before beginning any work, it is important to carefully protect the unaffected areas. MasterTech technicians are fully trained to carefully isolate all areas of concern with the appropriate barriers and covers to avoid cross-contamination. Proper Cleanup & Disposal– While most mold can be effectively removed from the surface of building materials without the use of toxic agents, in more severe cases of mold, some building materials may be non-salvageable. Our technicians are trained in the most advanced techniques for the safe, effective, and efficient removal and disposal of non-salvageable, mold-infested building materials. MasterTech provides the safest and most effective mold removal in New Jersey. Ultimately, our goal is to return you and your family to a mold-free and safe environment. To do so, MasterTech uses the safest and most advanced mold remediation techniques available. At MasterTech, we take every possible measure to maintain the utmost quality control. 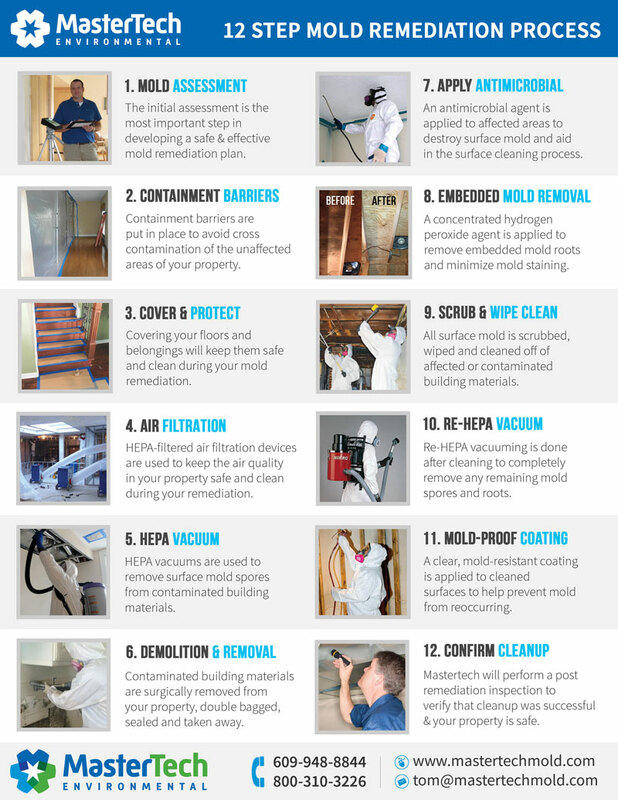 Each mold technician is thoroughly trained in all mold remediation procedures and protocols. As an extension of our commitment to ensure your safety and your family’s safety, we back every mold removal in Eastampton, NJ with a 5-year mold-free warranty. It is our promise that the mold has been properly removed; thus, it will not grow back. For mold inspection and mold removal in Palmyra, NJ or mold inspection and mold removal in Woodland, NJ, call 609-948-8844.